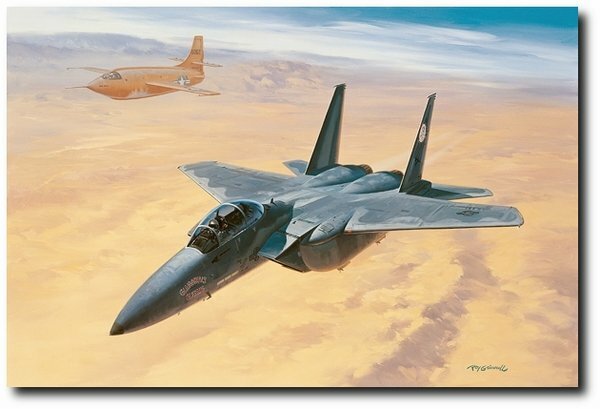 Size of Print: 24" x 30"
High over the windswept Edwards Air Force Base in California's Mojave Desert on 14 October 1997, Brig. Gen. Charles E. "Chuck" Yeager pushed his McDonnell Douglas F-15D fighter once again through the sounds barrier. Streaming a white contrail across the clear blue sky, Yeager radioed back to the ground, "I'm smoking along at about 1.35", by which he meant 1.35 times the speed of sound, or roughly 900-950 mph. Gen. Yeager had been supersonic hundreds of times before, but this particular flight was special, for it marked the 50th anniversary of his historic flight in the little orange painted Bell X-1 rocket-powered aircraft in which, on 14 October 1947, he became the first man to fly faster than the speed of sound. It would also be Yeager's last flight as an Air Force test pilot and consultant, a job he had held since retiring from active duty in 1975. In an interview following the flight, Yeager commented, "I'll miss military flying. I've been doing it for 55 years. I've been very lucky...I might as well hang it up while I'm on top." Hand signed by Ace Charles E. Yeager and the artist Roy Grinnell.